7670 Hailfire Droid and Spider Droid is a Star Wars: The Clone Wars set released in January 2008. Although it was released in January 2008, it was part of the The Clone Wars line which had its actual release date of July 26, 2008. The Hailfire Droid is built up of mainly brown and transparent red pieces. The wheels are made up of very small tread pieces, which interlock together to form a tread, which goes around a circular transparent, barely visible, dish, making the tread pieces look like a wheel. The middle part of the droid is its main eye, shown as a transparent red stud. Triangular brown pieces cover underneath the left and right of the eye. A smooth brown piece covers the top of the droid, and also connects it to the missile rack, where four transparent red flick-fire missiles can be launched. The Spider Droid is built up of mainly brown and dark stone grey pieces. 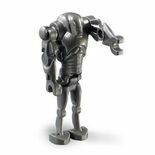 The legs, which can be moved up and down, are built out of dark grey Battle Droid torsos, which connect to a brown arm, forming a leg. The legs connect to a black connector piece, which also connects the legs to the head. The head is a ball container piece, with an antenna on top. The eyes are transparent red, and are made out of a telephone piece. The gun underneath the eyes can be moved up and down, and is dark grey. The Hailfire Droid, or the IG-227 Hailfire-class droid tank, was a droid mainly used in the battle of Geonosis. It was extremely fast and could destroy a Republic AT-TE Walker with one shot from its missiles. It also uses its oversized wheels to run over large groups of Clone Troopers and other equipment. However, its main eye was very vulnerable and would explode if the eye was destroyed. The Spider Droid, or the DSD1 dwarf spider droid, also used in the Battle of Geonosis, were often used on the front lines of battle. Its legs were designed to be able to walk straight up and down walls and narrow cliffs. Its central blaster cannon was equipped with two modes, a fast-firing mode for killing the enemy or a heavy mode, which was able to destroy light-armored vehicles. The box was originally released in the Attack of the Clones theme, and wasn't released with the new Clone Wars packaging until September, 2008, before having a Star Wars Episode II printing. This is a description taken from LEGO.com. Please do not modify it. (visit this item's product page) The droid army of the Clone Wars! The Separatist army is on the attack! Roll into battle with the giant-wheeled Hailfire droid with 8 flick-firing missiles. The heavily armed and armored spider droid is close behind, backed up by a squad of battle droids! Includes folding Hailfire droid, spider droid, super battle droid, battle droid commander and 2 battle droids! 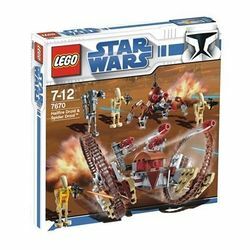 The set was first packaged within an Attack of the Clones box. Facts about "7670 Hailfire Droid and Spider Droid"
The droid army of the Clone Wars!